Rep.-elect Alexandria Ocasio-Cortez (D-NY), fresh off her underdog congressional win in New York, is quickly distancing herself from the Trump White House. While the president is sending troops down to the U.S.-Mexico border to prevent the 7,500-strong migrant caravan from entering the U.S., Ocasio-Cortez tweeted Sunday that we have nothing to fear from these individuals who are simply seeking asylum. Sen. Lindsey Graham (R-SC) doesn't see it that way. The migrant caravan approaching the U.S. border and Nazi Germany don't compare, he told her in a tweet on Monday. To witness real suffering, he invited Ocasio-Cortez to pay a visit to the D.C. United States Holocaust Memorial Museum. "Americans want an immigration policy which we control, not one where illegal immigrants control us. We are a nation of immigrants. We are also a kind and generous people. But Americans will not be played for fools." 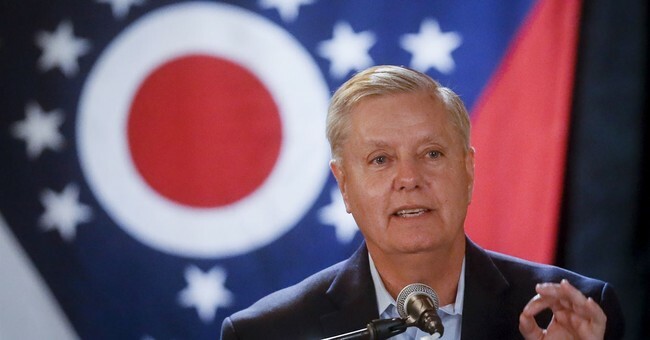 Graham reminded his followers that he's worked to fix America's immigration system for over a decade, so he may know a thing or two about what will or won't work. He reached out to Democrats, many of whom he knows have hearts of compassion, entreating them to work with Republicans on first securing the border. Still, Ocasio-Cortez and others have criticized border patrol agents for using aggressive tactics like pepper spray and tear gas to repel migrants from the U.S. border. Some of those rushing toward the border, however, hurled rocks at those agents, making the pepper spray "absolutely" the right decision, according to the Border Patrol Foundation. "DHS will not tolerate this type of lawlessness and will not hesitate to shut down ports of entry for security and public safety reasons," Department of Homeland Security Secretary Kirstjen Nielsen said in a statement on Sunday. And shut down they did. The San Ysidro Port of Entry, one of the busiest along the border, was temporarily not open for business on Sunday.